Are Sardines a Good Source of Calcium? Whether it’s because they’re economical, intensely flavored or usually found in a can, sardines are widely regarded as low-end fare in the United States. These small, plentiful fish are as nutritious as they are underappreciated, however, which is why "The New York Times" calls them one of the “best foods you aren’t eating.” Making sardines a regular part of your diet can significantly boost your intake of several important nutrients, including calcium. Sardines deliver more calcium per serving than virtually any other food, largely because they’re full of soft, edible bones. A 3-ounce serving of oil-packed Atlantic sardines – or approximately seven whole fish, according to the U.S. Department of Agriculture – provides about 175 calories and just over 320 milligrams of calcium. This amount is equivalent to 32 percent of the recommended daily value, which means that Atlantic sardines are more than a good source of calcium – they’re an excellent source. The larger Pacific variety is also high in calcium. You’ll get about 175 calories and 23 percent of the daily value for calcium from a 3-ounce serving, or approximately 2 1/2 whole fish. Your body contains more calcium than any other mineral. While it’s mostly used to build strong bones and teeth, calcium is also necessary for normal hormone, nerve and muscle function. Most adults should get about 1,000 milligrams of calcium a day. Women and men past the ages of 50 and 70 need slightly rising levels to minimize bone loss. When it comes to bone health, sardines are more than just an excellent source of calcium – they’re also rich in vitamin D, a nutrient that helps you absorb and use calcium. A 3-ounce serving of Atlantic or Pacific sardines delivers just over 40 percent of the daily value for vitamin D, according to the USDA. They may be small, but sardines are packed with nutrients. A 3-ounce serving of the Pacific variety provides 20 grams of protein, 12 percent of the daily value for iron and 9 percent each of the daily values for potassium and zinc. It also supplies about 140 percent of the daily value for vitamin B-12. Atlantic sardines are nutritionally similar. Like salmon, tuna and other fatty fish, sardines are rich in heart-healthy omega-3 fatty acids. These dietary fats reduce inflammation and are essential to normal brain function. Because omega-3’s are also thought to protect against heart disease, the American Heart Association recommends eating sardines or other kinds of fatty fish at least twice a week. Sardines are the ultimate convenience food. If you don’t mind their intense fish flavor, you can eat them as-is – whole and straight from the can. While sardines are never packed in water, according to the book “Wellness Foods A to Z: An Indispensable Guide for Health-Conscious Food Lovers,” you will find them packed in olive oil, sardine oil, mustard or tomato sauce. Use fork-mashed sardines as the basis for a high-calcium sandwich spread, or add them to a batch of homemade mashed potatoes. Combine them with sauteed vegetables or tomato sauce to serve over pasta or quinoa. Saute sardines in olive oil with fennel and raisins, then toss the mixture with some fresh kale and a bit of lemon juice. When you’re hungry and in a hurry, sardines served over whole-grain crackers make a healthy, satiating snack. 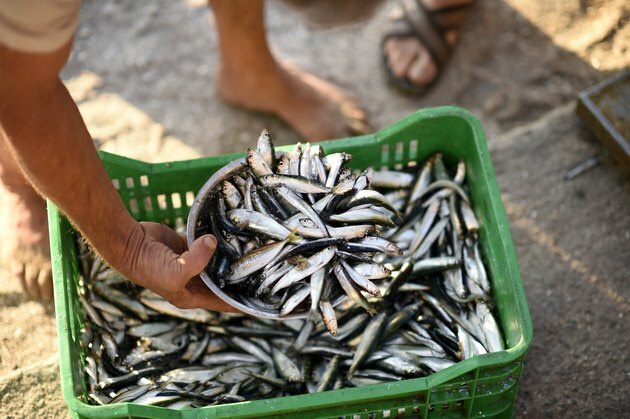 Can I Eat Anchovies When Pregnant?